Our last two days in Malaysia were lots of fun. Monday 21st February, our host Christina took us out for a traditional Indian breakfast – yum! We were joined by a lovely family from China – hi to Roger and family. 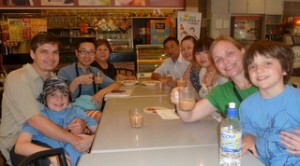 Roger and family from China joining us for an Indian breakfast. Wow, we have been busy and have not had much time to think about writing a post until now; plus it is quite time consuming and frustrating at times to master the web program. Our first full day of fun in KL started early with a breakfast wake up call from Anita at Galloway Flat with our breakfast, freshly made roti, curry and dhal with some bananas on the side. The boys tucked in heartily and polished of their share and looked for more; just the kind of energy they needed to catch up on some homework! Today we ate noodles and roti for breakfast! We are still working out the transport system and changed our plans to go to the KL Tower and the surrounding forest first today. 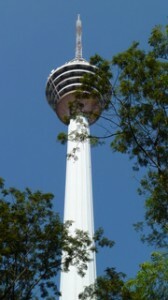 Menara KL Tower, Kuala Lumpur, Malaysia.